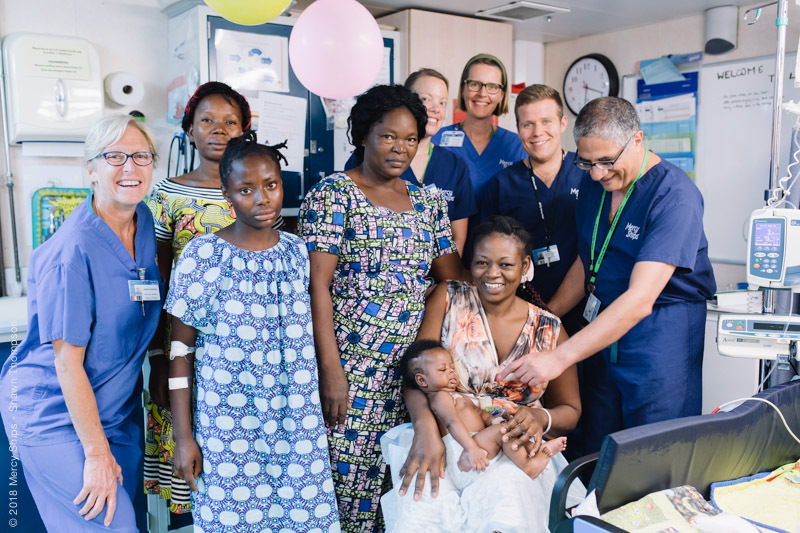 Photo Caption: Dr. Emil and Dr. Etienne St-Louis, McGill surgery resident, with patients, families, and nurses on the ward. As I was just about to leave for Africa, I heard a fascinating report on National Public Radio in the US. It was about Quebec. A group of 600 physician specialists had signed a petition asking the Quebec Government to direct increased funding towards nurses, not physicians. The event received international attention and helped highlight the crucial role of the nursing profession in patient care anywhere in the world. I am truly fortunate to work with amazing nurses at the Children’s and the Shriners. Watching the Africa Mercy nurses in action is one of the most humbling experiences on the Ship. They come from different countries, speak different languages, had different training, and yet they create exemplary teams. Many have left positions behind in their native communities, not knowing if they will still be there when they return. Most are young and are doing this in the prime of their life. They not only volunteer. They have to raise funds to support their living expenses on the Ship. I am now half way into my mission. There are several very challenging patients on the ward, including a 3-month old baby boy recovering from the resection of a sacrococcygeal tumor that was about one third of his total weight. Attending to this one patient alone is a challenge at best. I am amazed by the level of care delivered. It reminds me that the best nursing is not delivered with resources, but with heart and passion. Every day I walk into the ward to see nurses who have travelled half way across the world to live in tight, shared cabins and serve those who most need them. They may not share their patient’s cultures or understand their languages, but they know that genuine compassion -- the desire to care and comfort -- can break down any barriers. And they break those barriers daily. My father in law, whose life was transformed by an organ transplant many years ago, always referred to his nurses as angels of mercy. And here, on the Africa Mercy, we’re blessed to be surrounded by many such angels.